Horace Albright was born in Bishop, California, January 6,1890. He attended the University of California, Berkeley, graduating in 1912. While confidential secretary to Secretary of the Interior Franklin Lane, he attended night school at Georgetown University to attain his law degree, and was admitted to the bar in the District of Columbia and California. He was appointed assistant director of the National Park Service when it was established, but was also acting director from 1917 to 1919 when first Director Stephen Mather was absent with severe illness. 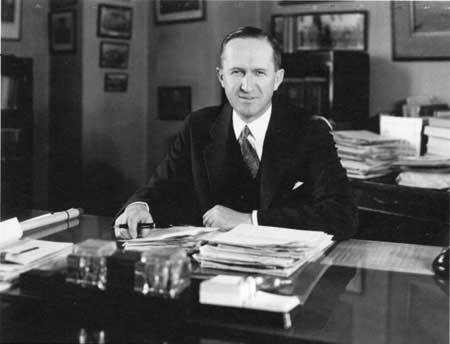 Other career mile stones included: superintendent of Yellowstone National Park and assistant director, field (1919-1929); director of National Park Service (1929-1933); vice president and later president of United States Potash Company (1933-1956). He married his college classmate, Grace Noble, with whom he had two children, Robert and Marian, four grandchildren, and 11 great-grandchildren. He died in Van Nuys, California, March 28, 1987. Beginning his career in Washington, D.C., Albright quickly rose from clerk to assistant solicitor and then secretary to Mather. During the summer of 1916, while Mather was away in the West, Albright attended meetings and discussions on the Park Service bill and saw it through to enactment. Four months later, Mather was hospitalized, and Albright, as acting director, organized the new bureau, set policies and procedures, and lobbied Congress for appropriations. He wrote the so-called "creed" for the National Park Service which appeared as a letter from Secretary Lane to Mather. Then as superintendent of Yellowstone, he also served as assistant director, field. When Yellowstone was closed in the winter, his job was to oversee all national park areas west of the Mississippi River as well as serve three on four months each year in the Washington Office. In 1929 Albright was named director and instituted two far-reaching policies — expansion of national park areas throughout the states east of the Mississippi River and introduction of historic preservation into the National Park Service. In April 1933, President Franklin Roosevelt agreed to Albright's request for the transfer to the Park Service of national monuments from the Agriculture Department and military parks from the War Department. With most of his goals realized, Albright resigned to become vice president, and later, president of the United States Potash Company. He remained with the company until his retirement in 1956. Horace Albright will be revered for his great contributions to a variety of causes, but perhaps he will be best remembered for his integrity, honesty, sense of humor, idealistic fighting spirit, loyalty, and devotion to his beloved National Park Service, which he had helped to found in 1916.